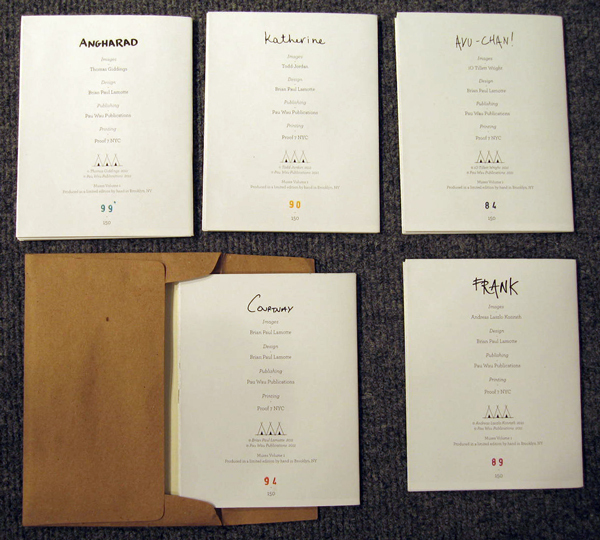 Pau Wau Publications, 2012 Unpaged, five booklets, 8 pages each with fold out posters, 4¼x5½". Pau Wau Publication’s anthology Muses Volume I is as unique as it is provocative. The book, if we choose to call it that, is an envelope compiling the works of five photographers, all reflecting on the idea of a 'muse.' Each photographer is given their own chapbook within the envelope; this is a great quality, the photographers seem to stand alone while being linked by common themes. The only downside is the fragility of the envelope itself, which is made of a simple thin brown paper. The operation of the book is diagramed on a handy little sheet that comes alongside the collection like the rule card in a deck of playing cards. 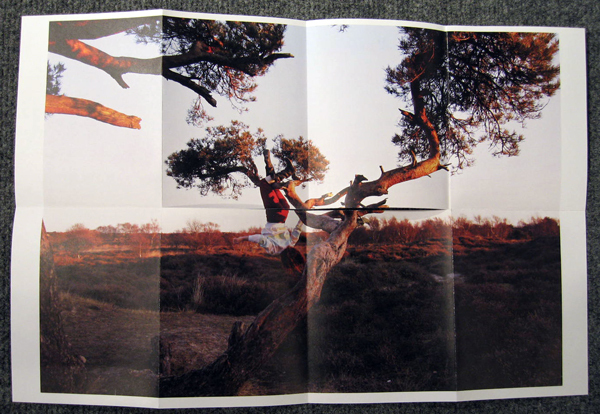 The smaller books can be folded out into one large photograph for each photographer’s collection. Pau Wau Publications’ website also has a nice video displaying the unusual folding and unfolding of the smaller books. The photographers in this anthology are Brian Paul Lamotte, Thomas Giddings, Todd Jordan, iO Tillett Wright, and Andreas Laszlo Konrath. Each provides a work of portraiture and each, I think, aims at a sort of intimacy, which in the cases of Lamotte, Giddings, and Jordan veers towards the voyeuristic (a sense which is increased by the anthology’s presentation). Muses Volume I, by Andreas Laszlo Konrath, Brian Paul Lamotte, iO Tillett Wright, Thomas Giddings & Todd Jordan. Pau Wau, 2012. These latter three works are a clear favorite; though they all have their own quality and aesthetic they obviously belong together. Lamotte’s collection “Courtnay” is beautiful. These photographs seem to capture something of isolation and indelible character. The subject is set over and over again at distances and obscurations or in more contrasting isolated settings such as a bathtub outside. The environments in “Courtnay” are the most interesting and enmeshed; they are not, like the others, coincidental. “Courtnay” also, among these collections, makes the greatest use of both natural and staged lighting making the series stand out on its own. “Angharad” by Thomas Giddings is a quite different work from “Courtnay,” while still set in a strange voyeuristic tone. It, like Lamotte’s work, follows a woman but, this woman is quite different. These photographs are consistantly of someone, presumably Angharad, looking in on the lives and activities of others. We see her looking in on tennis players, searching through her bag and sifting through sand. These are portraits of longing. Theses photographs, more than the others, have a sense of detachment set between viewer and subject; it's as if they were taken on accident or snapped off-hand, secretly. This quality usefully amplifies the pervasive feeling of the anthology. Todd Jordan’s “Katherine” is, in my opinion, the most well put together. It both defrocks and obscures its subject. Although the modeling of “Katherine” is unquestionable there is still something contained herein that smacks of shyness or guilt. The subject’s face is continuously withheld from our view as we encounter her in revealing positions and situations. One feels a little uncomfortable turning the pages of this book, as “Katherine” is more and more exposed to us the feeling of intrusion mounts. The more these photographs are inspected the more details pop out, the age of the subject, scratches from fingernails and the shabbiness of her clothing, that greatly add to the collection's feeling of the voyeuristic, perhaps even the sadistic. This collection has a strong and lasting savor. It is quirky and beautiful; an alternate title for it might be “Reluctance and Resignation.” “Katherine” as subject is constantly placed at the center of the shot adding to these photographs a sort of continual intrusion and query. They remind of David Lynch’s work, work where the color of everyday life is heightened into a kind of acute madness. They are photographs for the dashboard of a car or the floor of a locker, meant, it would seem, to be smudged by unwashed fingertips. Muses Volume I is sold out but Volume II is expected in the fall. Click here to be notified when it arrives. That would be "Courtnay" with an "a". Yes, the set is beautiful and I was happy to get one of the last available. Look forward to Volume II as well. Whoops! Thanks for pointing out the typo - I've corrected it in the text.